I gotta admit, I didn’t think Japanese policymakers had it in them to do what they did yesterday! It will expand its asset-buying program by another 10 trillion JPY to bring its total to 80 trillion JPY. It will extend its deadline for asset purchases from June 2013 to December 2013. It will remove its minimum bidding yield (currently at 0.1%) for purchases of government and corporate bonds. What are its reasons for doing so? The same as usual! Low growth in the homeland (some say the Japanese economy may contract this quarter), coupled with external threats (such as its territorial dispute with its largest export market), was one of the issues that pushed the BOJ to act so soon. Aside from that, many believe the BOJ’s move was also an indirect way of attacking the yen, whose strength has been hurting exports and reducing the value of Japanese companies’ overseas earnings. Oddly enough, the move even caught Japan’s finance minister, Jun Azumi, off guard. He claims the BOJ acted more aggressively than he had expected. But was it enough to impress the markets? Well, apparently not! True, the minute word got out that the BOJ would be boosting its stimulus program, the yen weakened sharply. 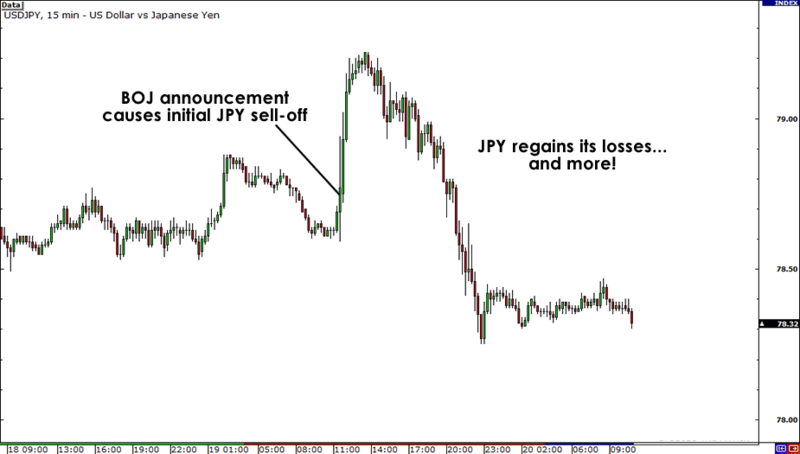 But the sell-off didn’t last as the yen came under strong buying pressure within a matter of hours. Why was the yen able to erase its losses, you ask? Although yesterday’s monetary policy announcement was one of the boldest ones we’ve had from the BOJ this year, its effect on the yen was limited because market participants already knew that the central bank was cooking up something big. If anything, investors were probably just surprised with the timing but weren’t completely blindsided by the decision. Not to mention, the BOJ’s 10 trillion JPY increase in asset purchases pales in comparison to those of the Fed and the ECB. Remember that the Fed announced open-ended quantitative easing and the ECB said that it would buy euro zone government bonds in unlimited amounts should countries request for it. What’s clear at the moment is that the BOJ is merely mirroring the moves of other major central banks. Sadly, it hasn’t been doing a convincing job. In this not-so-old man’s humble opinion, Japanese central bankers could’ve done a better job in putting a stop to the yen’s rally. For instance, they could’ve removed the deadline on their asset purchases or they could’ve extended the maturities of government bonds to over three years. Luckily, it seems that the BOJ has a bit of time to think its next move through as the current overall risk-on environment could keep the yen grounded… for now. Do you think the BOJ’s decision to increase asset purchases will be good enough to keep the yen from rising?